Surprised by the title of the article? At first, your friends, family, relatives or colleagues might be surprised by this gift. Most likely you have already heard enough about Bitcoin and cryptocurrencies - you have heard a lot of good and a lot of bad. However, nothing new, because each emerging and unexplored technology always has a barrage of criticism and negativity. So let us consider the main advantages of Bitcoin and cryptocurrencies over fiat money, by which we are all held hostage. Storage: What’s the problem with that? Most people keep their money in the bank and it suits them perfectly, it’s convenient. But answer this question - how many of you are confident in the bank in which you store your savings? Do you think the bank will warn you about their bankruptcy so that you can take away your savings in advance? 99% - no (only if your relative works in this bank and has time to warn you). Plus, banks can be hacked, and your funds and personal information stolen. If you have not insured your savings, there will be no options to return your money back. Management: And what’s the problem with that? My money is my money, you will say. But there is one nuance ... the money stored in the bank is yours, but it is managed not by you but by your bank! It's like a cookie for a child, on the highest shelf of the cabinet - cookie belongs to him, but he can only eat it if he’s well behaved, only if the parents allow him, and even after that he can eat no more than five pieces per day. Banks decide what information YOU MUST disclose when making a transaction - when making a transaction with YOUR money. Banks decide whether YOU can send YOUR money where YOU want. And the banks decide how much money YOU can send per transaction. Economic and international politics. I think you yourself will answer the question, what decision will the politicians take if the state needs money - raise taxes. It is the simplest and the most effective solution in their opinion, although raising taxes significantly increases the shadow economy, which in no way will bring more money to the state’s bank account. Because of the reckless policy of the states in relation to the domestic and foreign economy, and the policy in general, in the worst situation, are its own citizens. Indeed, due to the increase in taxes, companies are forced to raise prices for products and services in order to stay afloat. All this strongly beats the wallets of citizens. Well, if a bad international policy is also being pursued, then this greatly influences the rate of the currency itself, which becomes weaker in relation to other currencies. And dreams of buying property or going abroad are further and further away from you. Storage for Bitcoin, CloakCoin or other cryptos is the most convenient and secure among other assets because it can be stored on your computer, on a flash drive or on your phone - in the place that you consider to be the safest. Also, the entrance to your account is protected by a complex, long password that only YOU have access to! No one can hack your wallet, unlike bank hacks. Managing Bitcoins is simple and there are no prerequisites for this. You are your personal bank. You don’t need to disclose your personal information to anyone (the CloakCoin project and its anonymization system “ENIGMA” best of all protects user privacy), you have no transaction limits and you can send cryptocurrency anywhere. At the same time, it is worth mentioning that in the case of the CloakCoin cryptocurrency $CLOAK, the transaction will be completed in less than a minute. 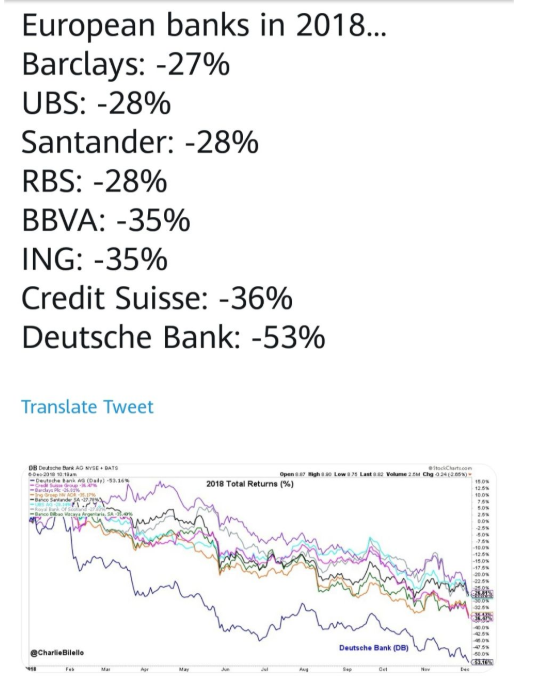 * The economic situation of the leading banks in Europe. Tweet link source. 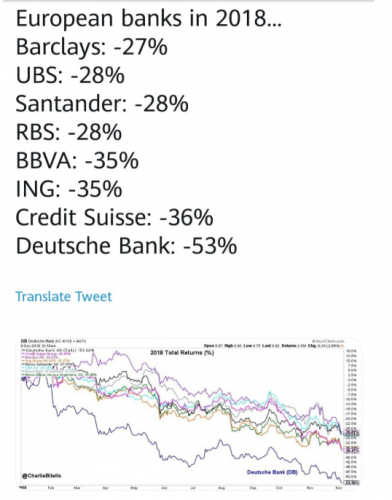 At the same time, Bitcoin is the best performing financial asset in the last 10 years. How do you like a gift that in addition brings you a passive income of 6% (or more)? This is what’s offered by CloakCoin. You just need to keep your $CLOAK currency in your wallet online and you will receive 6% per year (you will get 6% of your coins lying in your wallet, as a reward for helping secure the network). You don’t need to exchange crypto to any fiat money, because on the Internet you can use it to buy almost anything. For example, here you can check the entire list of sellers who accept $CLOAK cryptocurrency as a payment method. Spend $CLOAKs earned from passive income in a fast, easy and completely anonymous way. I don’t know about you, but it’s definitely worth thinking about what you’ll be gifting your loved ones this year. Will you go with boring old fiat money or smart money with great potential and good passive income?